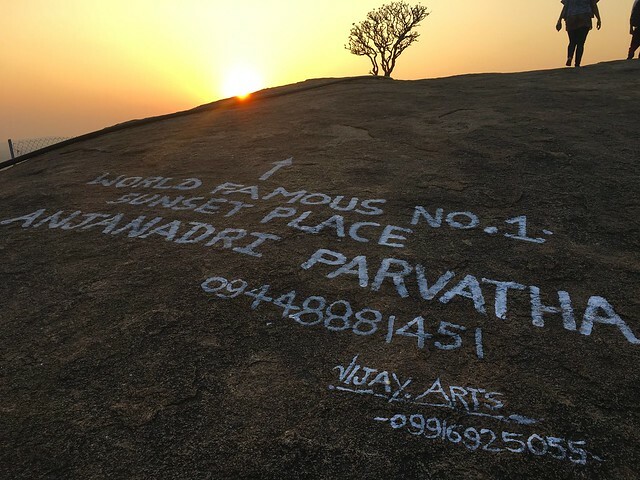 From our last blog you may have noticed we were off to Goa. 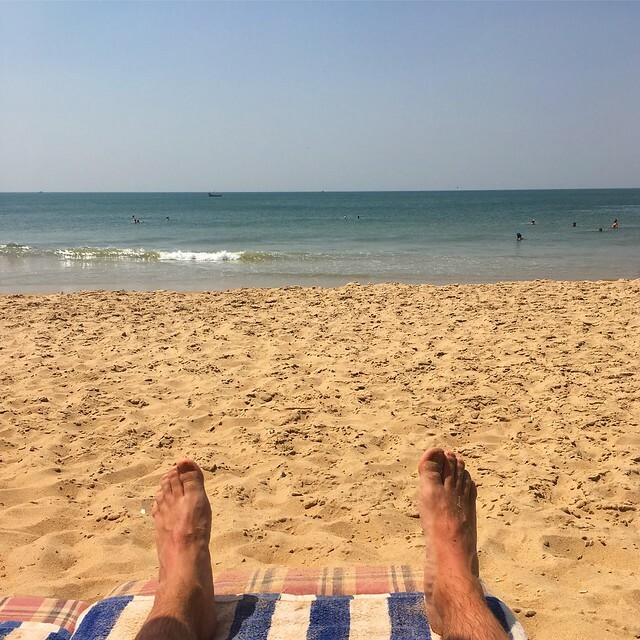 We didn’t write a whole blog about it as all we did was sit on a beach and play in the ocean. The only thing to note was we were in north Goa, in the Baga Beach area. By all accounts a cheap tourist trap. Nothing like the India we have seen. But it was relaxing none the less (apart from having to move hotels and waste half a day). Anyway, after a few days, we departed Goa at 5:30am and headed to Hampi on a sleeper train, but during the day, so no sleeping. Lol. After a long six and half hours we arrived around 3 and took an hours jeep ride to our hotel near the Unesco site. Our hotel, the Shanti Inn, was a small collection of huts right next to the paddy field. So mosquitoes were everywhere. Deet applied, we flew the drone over the paddy fields into the distance. The footage back was spectacular. We then headed to a nearby hill, and so called monkey temple (as there were lots of monkeys). 575 steps was the climb and very steep too. Mike went half way- to a little Pagoda and flew the drone around (away from the crowds- although he said he was surrounded by locals). I carried on to the top with the rest of the group. After some water and catching my breathe, I walked around, saw the monkeys and watched the sunset with about a hundred others. 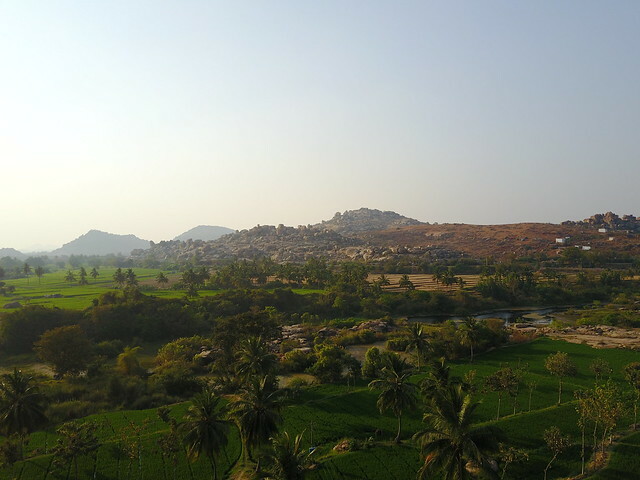 A beautiful view over Hampi and its strange boulder mountain geology. Back at our hut, we had dinner and local BBQ Indian special and slept under a mosquito net in the backing heat, our fan worked but was way to noisy to use – it was the choice between sweating all night or having a helicopter hovering a few feet above us. In the morning, bite free, we visited the Unesco World Heritage site. We had to walk down the path and across a river. It became apparent this was quite a ‘alternative’ destination judging by the tourists we walked past – basically a pilgrimage site for hippies. The site itself loomed over the largely dry riverbed and the main temple complex could be seen towering above. We had glimpsed it on the drone footage the night before but where unsure of what is was. After a 10 rupee boat ride, we ascended the stairs or Ghats and met our local guide for the day. First stop was the huge Shiva temple complex. Built in the 1300-1500s it was partially destroyed by Islamic invaders. Nonetheless it was magnificent, beautiful and imposing. The temple had monkeys galore jumping about the place, stealing people’s food and water bottles. There was even a local resident elephant, who for 10 rupees (she takes it out of your hand) gives you a blessing and rests her trunk on your forehead. 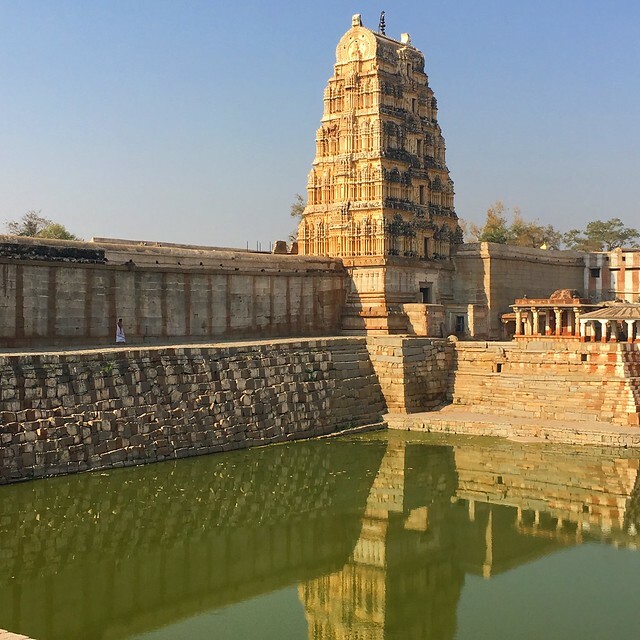 We explored with the guide, and took pictures, exploring the many rooms and inner temples. We then took tuktuk’s to another site. The whole place was huge and it would of been impossible to see without them. 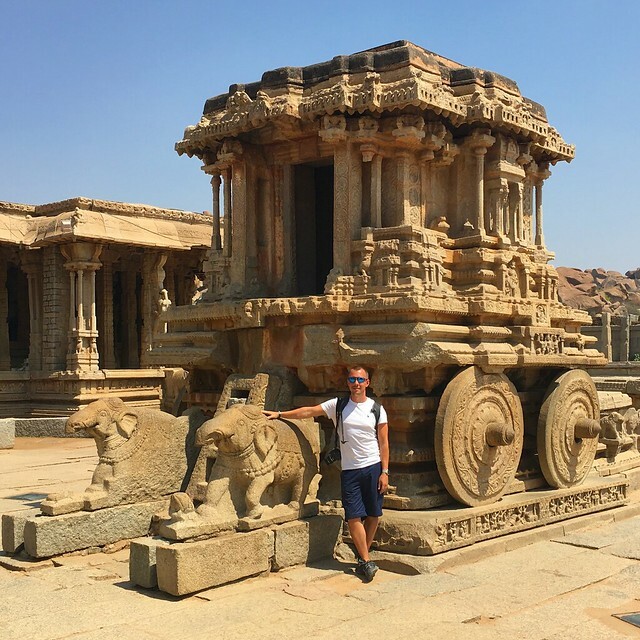 The next place was a massive enclosure area with many temples and the famous Hampi stone carriage, seen on the front of all the guide books the locals were trying to flog. The place had impressive carvings and pillars that played music. Our guide showed us and the sound was a type of wooden xylophone effect. There were hundreds of these pillars and we could imagine what it would if sounded like when they were all played. Apparently the noise reaches for over a kilometre. The ‘music temple’ was clearly an apt name. We took photos from interesting angles and departed in the midday sun for the next area. By this type the whole group was flagging in the heat, but we continued. The royal residences were next. Platforms, step wells, palaces and even an elephant stables were all on offer. There were again many impressive carvings, and some well maintained buildings given their age and past events. Mike did a quick bit of droning and filmed and snapped some pics from the air. We stopped on the way back for lunch in the village centre next to the first temple we visited. We opted for the traditional Indian classic- pizza. After we walked back and instead of taking the boat, Mike and I clambered over the rocks exposed by the low river level. We found a secluded spot and flew the drone again. We filmed the temples and took it down the river into the distance. Drone all packed up, we walked back to the hotel and relaxed for a few hours until we had to depart for our night train to Mysore. Our last night train in India, we were looking forward to seeing the back of them!